No minimum order and prices includes free setup and free delivery! We use digital printing (single, two or full colour) on all products which enables us to reproduce your images using flexible printing mediums with 'gloss' finishing on mugs which are dishwasher proof. Standard delivery is 2 weeks from artwork approval. 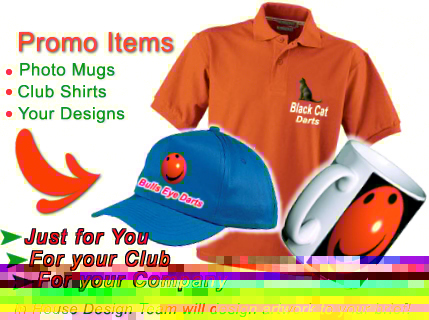 We can design graphics for you and also edit your own designs and photos for best suitability. We do not print vulgar images. Help with buying my darts? 2003-2009 Bulls Eye Darts All Rights Reserved Worldwide.